The Chargers picked up their biggest win of the season last night against the Chiefs, but they didn’t escape Kansas City unscathed. Already dealing with injuries to running backs Austin Ekeler and Melvin Gordon, they suffered another blow when star receiver Keenan Allen went down in the first half. Allen never returned to the game, and now we have an update on his status. Allen has been diagnosed with a hip pointer, according to Ian Rapoport of NFL Network (Twitter link). While it is a somewhat significant injury, Rapoport notes there is no structural damage to his hip. He writes that it isn’t a longterm injury, and although he says he could “miss some time” it sounds like Allen will be back in time for the playoffs at the absolute latest. Odell Beckham Jr. will miss a second straight game this week, Giants head coach Pat Shurmur announced today (Twitter link). Beckham is dealing with a quad injury, but the details are murky. He apparently suffered the injury a few weeks ago, and was initially able to play through it, but seemingly it’s taken a turn for the worse. The team has been very tightlipped about what exactly happened, but more details should leak out eventually. The Buccaneers are still somewhat alive in the playoff race, but they’ll be playing the Ravens this week without receiver DeSean Jackson. Jackson will be missing his third straight game with a thumb injury. While the Bucs would surely love to have Jackson out there against a stingy Baltimore defense, Chris Godwin has filled in just fine in his place across from Mike Evans. All signs continue to point toward Jackson and Tampa Bay separating at the end of the year. The Raiders have suddenly come alive and played some good games the past few weeks, upsetting the Steelers as massive underdogs last week. But they’ll be facing a tough Bengals defensive line without at least one starter on their offensive line. Left guard Kelechi Osemele has been ruled out for the game, and right guard Gabe Jackson is questionable after not practicing all week. If Jackson can’t play either it would be a disaster scenario for the Raiders, as their top reserve guard was just placed on injured reserve. Chargers wide receiver Keenan Allen has been cleared for organized team activities as he continues to recover from a torn ACL, according to Eric D. Williams of ESPN.com. Allen, who suffered his knee injury during the first game of the 2016 season, is now ahead of schedule, but Los Angeles is still using a “cautious approach,” per Williams. While Allen has been a force when on the field, he’s appeared in only nine games over the past two seasons due to injury. In 2015, Allen had already managed 67 receptions, 725 receiving yards, and four touchdowns in eight contests before going down with a lacerated kidney. Still only 25 years old, Allen is signed through the 2020 season after inking a four-year, $45MM extension last summer. While the Chargers may not have another receiver of Allen’s caliber on the roster in the event that he is forced to miss time, Los Angeles has acquired an enviable amount of depth at the wideout position. The Chargers used the seventh overall pick on Clemson pass-catcher Mike Williams, who will team with Tyrell Williams, Dontrelle Inman, and Travis Benjamin as the Bolts’ wide receivers. Keenan Allen‘s season is already over. The Chargers announced that they have officially placed their best wide receiver on IR. In a related move, the Chargers have activated defensive end Joey Bosa to their 53-man roster. Allen suffered what was feared to be a torn ACL on Sunday. Today, those fears were confirmed by an MRI. Without Allen, the Chargers are without their top receiving weapon and that is especially devastating since Stevie Johnson is already on IR. Tyrell Williams, Travis Benjamin, Dontrelle Inman, and Isaiah Burse will be asked to pick up the slack at receiver. Of course, tight end Antonio Gates can expect to see more targets as well. We expect the Chargers to explore free agent options and the list of available veterans includes names such as Brian Hartline, Roddy White, and Aaron Dobson. Of course, none of those players can match the skill set of a healthy Allen, but beggars can’t be choosers. If there is one silver lining here, it is that Allen’s other ligaments are intact, as Ian Rapoport of NFL.com tweets. That will make rehab a bit easier for the 24-year-old. 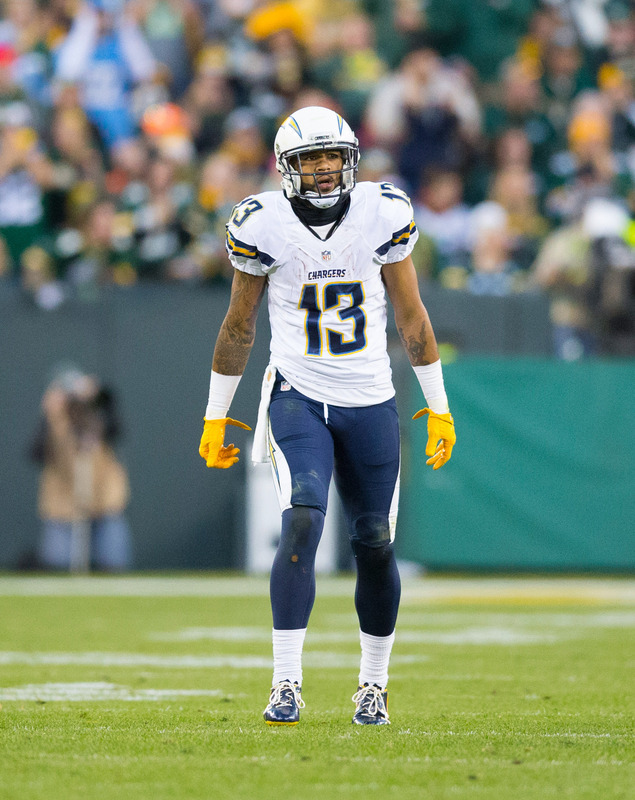 For the second consecutive season, Chargers wide receiver Keenan Allen‘s season has been cut short by a major injury. Initial tests show that Allen has likely suffered a torn ACL, according to Ian Rapoport of NFL.com (Twitter link). Video of the play can be viewed here, courtesy of Charles Robinson of Yahoo! Sports. Allen, who signed a four-year, $45MM extension earlier this year, has been a force since entering the league as a third-round pick in 2013, and is still only 24 years old. After topping 1,000 yards receiving and scoring eight touchdowns during his rookie campaign, Allen came back down to earth in 2014, but was on pace for the best season of his career last year. With 67 receptions and 725 yards under his belt through only eight games, Allen suffered a lacerated kidney and was forced to miss the rest of the campaign. The Chargers had already lost another member of their pass-catching corps, as Steve Johnson is done for the year after tearing his meniscus in August. As such, San Diego’s depth chart will now see free agent signee Travis Benjamin at the top, followed by Tyrell Williams, Dontrelle Inman, and Isaiah Burse. The club has two WRs on its practice squad in Jonathan Krause and Dom Williams that could conceivably be promoted, or the Chargers could turn to the free agent market for help. One intriguing option for the Bolts may be James Jones, who spent time with the club this summer before being released. Seyi Ajirotutu and Vincent Brown also have a history with the Chargers, but neither is likely to make much of an impact. Veterans such as Roddy White and Nate Washington are available, but the free agent with the highest upside is probably Rueben Randle, who was released by the Eagles last month. The contract extensions the Cardinals awarded quarterback Carson Palmer and future Hall of Fame receiver Larry Fitzgerald on Friday extend the team’s Super Bowl window beyond this season, Josh Weinfuss of ESPN.com contends. As an added benefit, the Cardinals now have extra time to find a successor to the 36-year-old Palmer, and they no longer have to worry about losing two of their top wideouts – Fitzgerald and free agent-to-be Michael Floyd – at season’s end. Worst-case scenario, the Cardinals’ receiving corps will still contain Fitzgerald and John Brown in 2017. Palmer’s deal with the Cardinals features a $6.75MM signing bonus and fully guarantees his $15.5MM salary and bonus for 2017, according to Dan Graziano of ESPN.com. On the other hand, neither Palmer’s $12.5MM salary nor $1.5MM roster bonus for 2018 are guaranteed. The Chiefs‘ signing of Nick Foles has no impact on Alex Smith‘s short- or long-term future with the club, according to head coach Andy Reid (via Adam Teicher of ESPN.com). “It’s Alex’s football team,” Reid said. “Nick knows that it’s Alex’s team. Alex knows it’s Alex’s team.” Foles, who was next to Reid, echoed that sentiment. Smith is under contract through 2018 after signing a four-year extension in September 2014. The four-year extension the Chargers gave receiver Keenan Allen in June is the team’s best deal, opines Jason Fitzgerald of Over the Cap. Allen’s contract is worth $45MM, including $20.7MM in guarantees, which Fitzgerald regards as a bargain for a 24-year-old who has averaged 93 catches, 1,104 yards and seven touchdowns per 16 games during his three seasons in the NFL. Conversely, the four-year, $28MM pact the Chargers handed left tackle King Dunlap last offseason is their worst, writes Fitzgerald, who argues the Bolts made an unnecessary commitment (including $8.5MM in guarantees) to a player who only should’ve been a stopgap. In other Friday news, Oakland waived pass rusher Damontre Moore, San Francisco lost receiver Eric Rogers for the season and Kansas City agreed to a deal with safety Jeron Johnson. One year ago, the Chargers locked up quarterback Philip Rivers. Over the weekend, the Bolts extended one of his top targets. Michael Gehlken of The San Diego Union-Tribune reports that the Chargers have agreed to a four-year extension with wideout Keenan Allen. NFL Network’s Rand Getlin tweets that the deal is worth $45MM, with at least $24MM in guaranteed money, including a $9.5MM signing bonus. ESPN.com’s Adam Caplan writes that the deal is expected to be “finalized and signed” in the coming days. The team confirmed the agreement on their website. This is quite the pay increase for Allen, as the former third-round pick signed a four-year, $2.8MM contract after being drafted in 2013. Since that time, the 24-year-old has established himself as one of Rivers’ favorite wide receivers. The former California Golden Bear compiled 1,046 yards and eight touchdowns during his rookie season, and he followed that up with a 77-catch campaign in 2014. Allen was on track to set several career-highs in 2015 before a kidney laceration ended his season. Allen will receive $21.656MM fully guaranteed, which includes his 2016 base salary of $1.656MM, reports Mike Florio of Pro Football Talk. The deal also includes another $2.5MM in injury guarantees, tweets Ian Rapoport of the NFL Network. Allen can earn $2MM for 2019 if he catches 90 passes and the Chargers make the postseason or if he catches 100 passes and the club wins eight games in 2016, 2017, or 2018. For 2020, Allen can make $2MM if, after unlocking the extra $2MM for 2019, he reaches 90 catches and San Diego makes the playoffs, or he logs 80 catches and the team reaches eight wins, before the 2020 season. Having been eligible for an extension since March, Gehlken notes that the two sides have been working on a new contract since the conclusion of the NFL draft. A five-year deal was reportedly discussed, but the current deal will allow Allen to hit free agency before he turns 30-years-old. A presumed $11MM annual salary would rank eighth in the league among receivers, tied with Larry Fitzgerald and Jeremy Maclin. TUESDAY, 6:09pm: The Chargers are offering Allen more than $10MM annually, according to Mike Garafolo of FOX Sports (Twitter link), who adds that the two sides aren’t all that far apart in talks. MONDAY, 7:57pm: The Chargers are exploring a long-term deal with wide receiver Keenan Allen, sources tell Connor Orr of NFL.com. Allen and the club are interested in working out an accord with a length of four or five years, according to Orr. Extension talks between San Diego and Allen have been rumored for some time, as Michael Gehlken of the San Diego Union-Tribune reported in March that the club was expected to reach out to its star pass-catcher following once free agency and the draft concluded. Both those markers have passed, of course, but Gehlken tweets today that the situation is “still developing,” indicating that it’s too soon to say whether these negotiations will result in a deal. Allen has been a force since entering the league as a third-round pick in 2013, and is still only 24 years old. After topping 1,000 yards receiving and scoring eight touchdowns during his rookie campaign, Allen came back down to earth in 2014, but was on pace for the best season of his career last year. With 67 receptions and 725 yards under his belt through only eight games, Allen suffered a lacerated kidney and was forced to miss the rest of the campaign. He’s expected to be fully healthy for the 2016 season, but it’s easy to wonder what might have been. Given his career stats, Allen’s camp is sure to ask — at a minimum — to match the four-year, $40MM extension inked by Jaguars receiver Allen Hurns last week. Hurns and Allen are the same age, but Allen could surely argue that he’s worth more than than Jacksonville pass-catcher. An $11MM annual salary, making Allen the eighth-highest paid receiver in the NFL, isn’t out of the question, and the Chargers star should also top $20MM in guarantees. Were the two sides to reach an impasse between now and next spring, the Chargers could hold the franchise tag over Allen’s head, allowing them to control him for one more season (at least). The wide receiver franchise figure was $14.599MM in 2015, so San Diego would need to be willing to carry a cap charge north of $15MM in order to retain Allen if it goes down that road. The Eagles, who desperately need help at guard, are targeting Chiefs pending free agent Jeff Allen, reports Les Bowen of Philly.com. Given Allen’s connection to new Eagles head coach Doug Pederson, who was previously Kansas City’s offensive coordinator, this news comes as no surprise. The Packers’ James Jones, set to be part of the upcoming class of free agent receivers, is confused that he isn’t generating much buzz after totaling 50 catches, averaging a tremendous 17.8 yards per reception, and amassing eight touchdowns last season. “I’m hearing a lot of these receivers names being called and people are trying to brush over my name, and I had one of the best seasons out of all these guys that are free agents,” the 31-year-old said. On re-signing with Green Bay, he added, “I was hoping it would go be back to Green Bay, but I don’t know what’s going to happen” (link via Conor Orr of NFL.com). Once free agency and the draft are out of the way, the Chargers will initiate extension talks with contract-year wideout Keenan Allen, according to Michael Gehlken of the San Diego Union-Tribune. Even if the the Chargers drag their feet on giving Allen a new deal, he has no intention of holding out, per Gehlken. The soon-to-be 24-year-old racked up a whopping 67 catches in just eight games last season. That followed back-to-back 70-reception seasons in his first two years. First-year Titans general manager Jon Robinson said Friday that his offseason focus lies with improving the team’s offensive line, acquiring offensive playmakers, and adding “players who can help us get off the field on third down on defense,’’ per Jim Wyatt of TitansOnline.com. The chances of pending free agent defensive backs Josh Robinson and Robert Blanton returning to the Vikings are “not good,” according to Chris Tomasson of the St. Paul Pioneer Press (Twitter link). Robinson played in five games last season and wasn’t a factor. Blanton suited up for all 16 games, but appeared in just 21.5% of the Vikings’ defensive snaps.